The evolution of carport design has yielded a leaner, more cost-effective structure that can deliver both the duty of vehicle protection and the function of a solar power plant. While a fairly large number of solar and other companies have attempted to enter this promising carport market — as evidenced at the recent Intersolar 2015 show — not all have succeeded. “Engineering a carport is exponentially more complex than the most difficult ground-mount or ballasted roof system, and it is outside of the comfort zone of a lot of solar companies,” says Ben Jones, the vice president of market development at S:Flex, based in Denver. Participating in the market has its rewards, nonetheless. 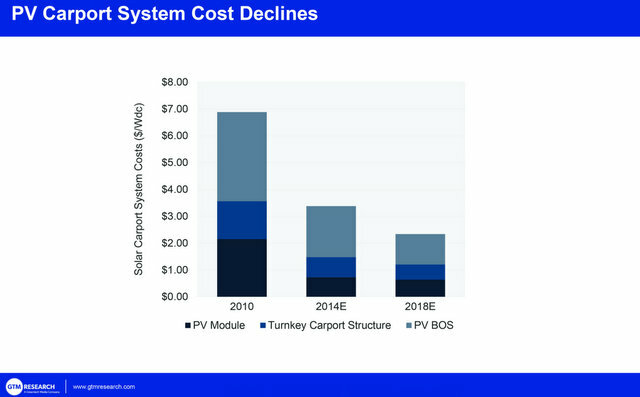 A study by GTM Research projected consistent growth in solar carport installs to 2016. “2014 was the fourth consecutive year during which greater than 100 MW of solar carport installations were installed,” says Scott Moskowitz, a solar analyst at the Boston-based firm. His “U.S. Solar Carport Market 2014-2018: Landscape, Outlook and Leading Companies” report was released in August 2014. 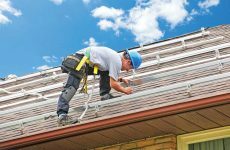 One estimate for the cost of adding a carport to a solar system, compared to a simple ground-mount system, is as little as 50 cents per installed watt. However, some states, like Massachusetts, are directing their solar incentives toward carports rather than mere ground mounts to conserve developable land area, says Matt Harrison, the marketing director for Baja Construction, based in Martinez, Calif. Baja, which is active nationally, leads the industry with some 150 MW of carports installed since 2007. Electric vehicles taking over the road is no longer a question. Sales of plug-in hybrid electric vehicles and all-electric vehicles have surged recently. So now the question is where are all of these things going to get their juice? A new study from the U.S. Department of Energy’s National Renewable Energy Laboratory (NREL) quantifies how much charging infrastructure would be needed in the United States to support various market growth scenarios for plug-in electric vehicles (PEVs). NREL notes that most PEV charging occurs at home, but widespread PEV adoption would require the development of a national network of non-residential charging stations. Strategically installing these stations early would maximize their economic viability while enabling efficient network growth as the PEV market matures. NREL says about 8,000 fast-charging stations would be needed to provide a minimum level of urban and rural coverage nationwide. No one asked us, but we think carport developments have a big opportunity (a carportunity!) to lead the way. The segment is seeing notable reductions in system costs and installation timelines that only make more projects viable. Eliminating metal has been the greatest engineering challenge for carport construction thus far, and the main steel structure is the primary target. “Rather than using an off-the-shelf beam, we opted for a built-up three-plate tapered beam that saves 30 percent of the metal weight in a system; permits a span of 18 ft; reduces stress on the foundations, which can be smaller; saves on installation time; and saves on transport cost,” Jones says. To help with their design, S:Flex partnered with a Nucor division, CBC Buildings, of Lathrop, Calif., to bring steel building engineering and technology into the project. The S:Flex solution has been under design for the past 18 months, and several more refinements are planned for commercial release over the next six months, including a watertight panel-to-panel gasket, a curved roof solution and a roof-top canopy for multi-story carports, Jones says. Apart from the main structure, the purlins that rest atop and secure the solar panels have recently moved from aluminum to roll-formed steel of a lighter gauge. Mounting Systems, for example, unveiled its Sigma Steel system at Intersolar, in which “aluminum-forming technology has been transferred to formed steel,” says Don Massa, the project manager for the West Sacramento-based company. The new system also has been coated with Arcelor Mittal’s Magnelis self-healing coating with magnesium, for superior corrosion resistance compared with galvanization. 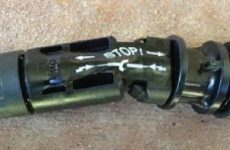 The Sigma line also features a unique U-shaped purlin that accepts slot-headed bolts. 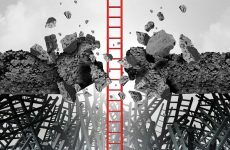 Even though advanced carport engineering has squeezed much of the excess material out of designs, the reduction of the federal tax credit for solar, from a current 30 percent to an anticipated 10 percent after 2016, will mean more carport developers will be pressured to make up the 20 percent difference somehow, Harrison says. “Panel prices dropped from $2.50 a watt to 60 cents a watt, and now people are looking at the BOS components for further cost reduction. Unfortunately, steel prices don’t go down, so we are sort of a slave to that market,” he notes. Moscowitz’ research suggests that the cost of turnkey carport systems will drop from an estimated $3.50 in 2014 to $2.50 by 2018, having already dropped from nearly $7 in 2010. His prediction includes some cost compression for the carport structure, but most will come from BOS reductions, including labor costs. While most of the U.S. carport installs to date have arisen from government-controlled facilities like municipal administrative buildings, regional school districts and the military, more commercial and industrial installs are likely as the market matures. “We have been pushing for the big box stores to adopt solar carports, but thus far it has not happened very widely,” Harrison says. Residential carports also may become a more popular concept as the spread of the electric vehicle continues and as vehicle owners opt to install solar+storage packages, including home EV-charging stations, as Tesla suggests. Another cost-cutting approach to carport development is pre-packaged modular kits. S:Flex, for example, offers five different kits for different regions around the country: one for the Southwest where there is no snow load; one for the Midwest where there is a typical snow load of 30 lb per sq ft (psf); one for the Northeast where the snow load is up to 65 psf; one for hurricane-prone locations with a wind rating of 180 mph; and one for the California government and public school market where unique design codes are required. Designing purlins with side slots so that panels may be installed from the ground has also saved double-digit percentages in labor costs for carports. S:Flex’ design, as do some other competitors, now features such slots. Racking companies were present in great numbers at the Intersolar North America 2015 show in San Francisco in July, and both established and new companies were widely represented. One company at the show, 4 S.T.E.L. 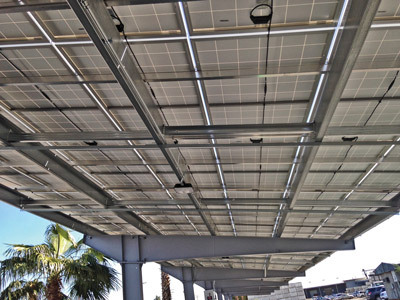 Engineering, based in San Clemente, Calif., has designed and engineered more than 100 MW of solar canopies, ground mounts and roof mounts in the past three years, including the massive Chaffey Joint Unified High School District in Rancho Cucamonga, Calif., that included 7.1 MW of solar over eight separate sites. KBRacking, based in Toronto, also announced a new national partner for its carport business at the show, Advanced Green Technologies. KB’s Superspan layouts feature cantilevered, single-slope T, double-slope Y and double-T profiles, the latter of which offers up to 100 ft of coverage width. FM Global also has certified the carports for winds up to 180 mph. Advanced Green Technologies (AGT), based in Fort Lauderdale, Fla., is an engineering, procurement and construction (EPC) company that provides services for solar carport installations throughout North America and the Caribbean, with extensive experience in high-wind zones. In February of this year, AGT was hired by Lockheed Martin to design and build a massive 2.3-MW carport at Lockheed’s Mission Systems and Training facility in Clearwater, Fla., which is now under construction. The project was then touted to be the largest private, non-utility owned solar array in Florida. 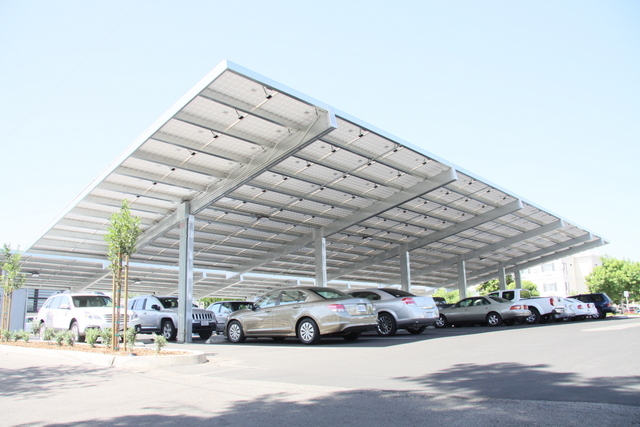 The Lockheed solar carport will cover 151,400 sq ft of parking, with 7,260 solar modules, to provide shade for 534 cars. The arrays feature Hanwha SolarOne S-series modules and will also include full under-canopy LED lighting.